Romantic�dinner of tender and juicy Filet Mignons. Romantic Dinner for Two. When you care enough to send the very best... Forks tender and delicious, Filet Mignons are accompanied by our All Natural Seasoning to perfectly complement your steak. Completing your meal are Stuffed Baked Potatoes with a blending of whipped potatoes, sour cream, cheddar cheese and bacon and Roasted Vegetable Medley in a delicately seasoned butter sauce. For the grand finale we add a large New York Cheesecake. Meal serves 2. Use steak cooking chart. Cut from the heart of the tenderloin, using the finest grain-fed beef, these Filet Mignons are aged to peak flavor and tenderness, vacuum wrapped and flash frozen to lock in freshness. Bake: Preheat oven to 350° F. Remove potato from package. Place desired number of frozen portions on an ungreased baking sheet. Bake 40 minutes, until heated through and lightly browned. Grill: Preheat grill. Remove potato from cellophane package. Place frozen potatoes on a sheet of aluminum foil. Wrapping foil around potatoes, leaving top half exposed. Grill on medium-high heat. Cook with grill lid down for 35 to 45 minutes. Microwave: Remove potato from wrap. Place one frozen potato on microwave safe dish. Cook on high for 21/2 to 4 minutes rotating at half way point. To cook two potatoes, increase cooking time to 4 to 6 minutes. Do Not Thaw! Microwave: Cut slit in center of film. Place tray in microwave; cook on high for 2-3 minutes. Carefully remove film, stir and cook on high for 1-2 minutes or until internal temperature reaches 165°F. Stir and serve. Oven: Preheat oven to 350°F. Carefully remove film from tray before baking. Place tray on baking sheet on oven center rack. Bake for 35-40 minutes or until internal temperature reaches 165°F. Remove from oven, stir and serve. Preparation: To thaw, place cheesecake in refrigerator overnight or thaw uncovered at room temperature for 1 to 2 hours maximum. Slice and serve. Refrigerate any unused portions covered in the refrigerator for up to 7 days. 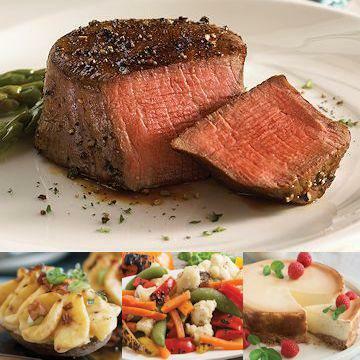 Serve on steak, poultry, pork, fish and vegetables to enhance flavor. Season as desired. Ingredients: Baked Potato with Shell, Water, Sour Cream (Cultured Milk and Cream, Nonfat Milk, Modified Corn Starch, Guar Gum, Locust Bean Gum, Carrageenan), Cheddar Cheese (Pasteurized Milk, Cheese Cultures, Salt, Enzymes, Annatto (Color)), Dehydrated Potato, Butter, Dairy Blend (Whey, Nonfat Dry Milk, Soy Flour), Bacon (Cured with Water, Salt, Sugar, Sodium Phosphate, Sodium Erythorbate, Sodium Nitrite), Salt, Dried Chives. Contains: Milk and Soy Ingredients. Ingredients: Sugar Snap Peas, Carrots, Cauliflower, Fire Roasted Red Peppers, Fire Roasted Green Peppers, Fire Roasted Yellow Peppers, Butter (Cream, Salt), Extra Virgin Olive Oil, Water, Salt, Spices, Dried Lemon Juice (Maltodextrin, Natural Flavors (Lemon Juice Solids)), Dehydrated Parsley. Contains: Milk. Ingredients: Ingredients: Cream Cheese (Pasteurized Milk and Cream, Cheese Culture, Salt, Carob Bean Gum), Sugar, Cake Base (Sugar, Enriched Bleached Flour [Wheat Flour, Niacin, Iron, Thiamin Mononitrate, Riboflavin, Folic Acid], Soybean Oil, Modified Corn Starch, Whey, Propylene Glycol Monoesters of Fatty Acids, Mono and Diglycerides, Leavening [Baking Soda, Sodium Aluminum Phosphate], Vital Wheat Gluten, Salt, Sodium Stearoyl Lactylate, Guar Gum, Xanthan Gum, Natural and Artificial Flavor, Egg, Soy Flour), Eggs, Heavy Cream, Cheese (Pasteurized Cultured Skim Milk, Milk Protein, Microbial Rennet), Water, Soybean Oil, Contains less than 2% of the following: Emulsifier (Soybean Oil, Mono-and Diglycerides, Propylene Glycol Mono- and Diesters of Fatty Acids, Glyceryl-Lacto Esters of Fatty Acids), Natural & Artificial Vanilla Flavor, Citric Acid, Caramel Color, Potassium Sorbate & Sodium Benzoate (as preservatives). Contains milk, eggs, wheat, soy and is manufactured in a facility that processes peanuts and tree nuts at the very bottom below ingredients.